First and foremost I am a firefighter/ EMT and have been for almost 15 years. I have also been working in the fitness industry as a Personal Trainer and author for 25 years. I’ve been fortunate to train with elite athletes for the NBA, NHL, and NFL and have studied under some of the top trainers in the world. I created FRF (Fire Rescue Fitness) out of necessity. When I joined my first department I realized I was not trained to meet the demands of the fire ground. I had to change the way I worked out or I was not going to make it as a firefighter. Here is an interview I did that explains my journey. 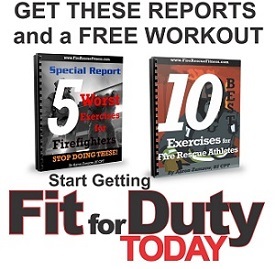 Please check out the Fire Rescue Workouts Page for programs created to get and keep you “Fit for Duty.“ I’ve created a wide range of programs to cater to all levels of Fire Rescue Athletes. I created Fire Rescue Fitness because I was discouraged by all of the programs on the market claiming to be geared toward firefighters. In most of these cases programs were written by trainers and not by firefighters. I developed the a wide range Fire Rescue Fitness Programs to give Firefighters, EMTs and Paramedics a foundation of fitness that not only gets you “Fit for Duty” but will take your fitness to the next level and keep you “Fit for Duty.’ All of my programs combine over 25 years of fitness and 15 years of Firefighting experience and are endorsed by hundreds of fire rescue athletes and elite trainers. On September 11th, 2011 I finished the Ironman Wisconsin, it was a long day…but so worth it. Cornell, D.J., Gnacinski, S.L., Zamzow, A., Mims, J., & Ebersole, K.T. (in press). Measures of Health, Fitness, and Functional Movement Among Firefighter Recruits. International Journal of Occupational Safety and Ergonomics.